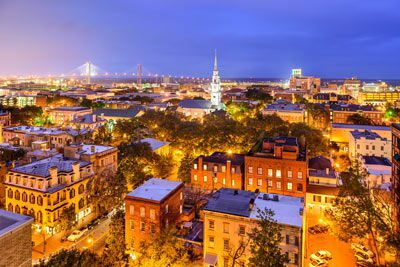 Savannah’s architecture and history are internationally known, as is its reputation for Southern charm and hospitality. Each year Savannah attracts millions of visitors, who enjoy the city’s architecture and historic buildings: the birthplace of Juliette Gordon Low (founder of the Girl Scouts of the United States of America), the Telfair Academy of Arts and Sciences (one of the South’s first public museums), the First African Baptist Church (one of the oldest African American Baptist congregations in the United States), Temple Mickve Israel (the third oldest synagogue in America), and the Central of Georgia Railway roundhouse complex (the oldest standing antebellum rail facility in America).The largest National Historic Landmark District in the United States, Savannah contains more than twenty city squares filled with museums, churches, mansions, monuments and famous forts of the Revolutionary and Civil War eras. Don’t miss the chance to see the beautiful cobblestone streets, manicured gardens, and oak-shaded parks drizzling with silvery Spanish Moss. The city’s location offers visitors access to the coastal islands and the Savannah Riverfront, both popular tourist destinations. 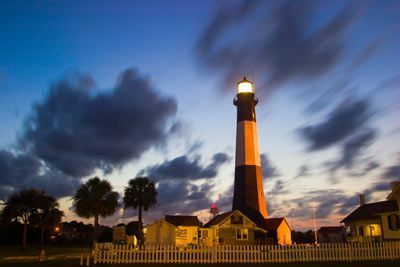 Tybee Island, formerly known as “Savannah Beach”, is the site of the Tybee Island Light Station, the first lighthouse on the southern Atlantic coast. 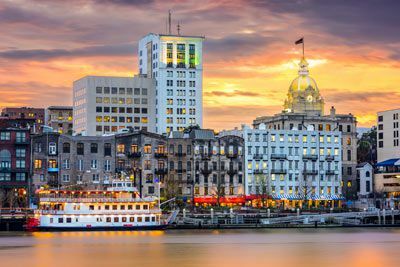 Savannah is the perfect Georgia vacation destination for all ages – abuzz with art, culture, festivals, concerts, live theater, outdoor cafes, gourmet restaurants, and true Southern hospitality. Located on Bay Street, this newly renovated Savannah riverfront hotel is situated near popular attractions like River Street, City Market, and Tybee Island. 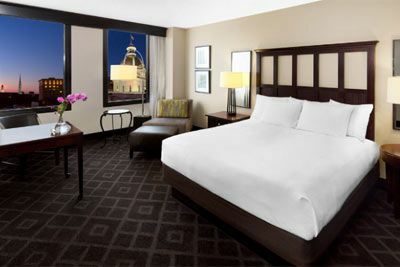 Located near River Front Plaza, this hotel offers unequalled access to the largest historic district in the country. 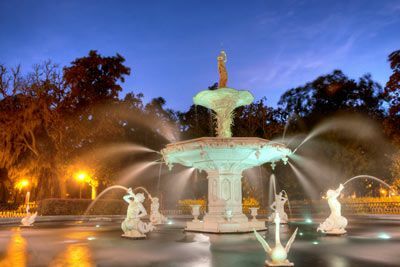 Stroll through the Historic District to view stately Georgia homes, landmark architecture, and famed Savannah sights like Forsyth Park. 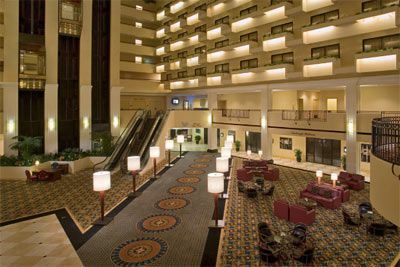 Board a riverboat, hop on the trolley for a moving tour, and enjoy close proximity to Savannah Hilton Head International Airport. Enjoy travel enhancing conveniences including a 24-hour fitness center and an indoor swimming pool. Enjoy an authentic southern breakfast or light specialty lunch at Windows restaurant with beautiful river views. For those on the go, don’t miss the popular coffee shop, Perks, serving specialty Starbucks® coffees, salads, sandwiches and pastries. Experience the Savannah nightlife and spectacular river views from Vu Lounge and enjoy a signature cocktail while mixing with locals and travelers on the largest river view terrace in town. Spacious guestrooms feature one king or 2 double beds (based on availability), wireless high-speed Internet, iHome stereo with iPod® docking station, signature Hyatt Grand Beds®, mini-refrigerator, coffee maker, iron/board, safe, and KenetMD™ bath products. Certified Registered Nurse Anesthetists: This program has been prior approved by the AANA for 24 Class A CEC; AANA Code #1035878; Expiration Date 12/7/2018. $100 October 5, 2018 to November 4, 2018. No refund after November 4, 2018; however, 50% of tuition paid may be applied toward tuition for another NWAS program within the next 12 months. Cancellation must be made in writing.